EU officials have been redrafting the Irish backstop protocol in a bid to make it more palatable to London, but the EU Brexit Task Force remains convinced that Northern Ireland will have to remain part of the EU’s customs regime if a hard border is to be avoided, RTÉ News understands. Sources say the Task Force has been trying to meet UK concerns by changing both language and emphasis in the original text. This includes the idea that British inspectors in UK ports could carry out limited checks on their own - and not in the presence of EU inspectors - to ensure customs and standards compliance for goods moving to Northern Ireland. Officials are also looking to reinforce the idea that any future trade relationship that obviates the need for a hard border on the island of Ireland would "supersede" the provisions of the backstop. A re-drafted text could also highlight the fact that elements of the backstop would automatically fall away if the future relationship is sufficiently comprehensive as to render customs and regulatory checks on the Irish border unnecessary. The British government objects to the current draft of the so-called backstop because it would imply that if the UK were to be outside the single market and customs union, with Northern Ireland effectively remaining inside, then it would mean a customs border along the Irish Sea. Michel Barnier, the EU’s chief Brexit negotiator, has said on several occasions that the EU could "improve" the draft protocol, which was first published last February. This has also been acknowledged by Irish officials. In February, British Prime Minister Theresa May told the House of Commons that no British Prime Minister "could ever accept" a backstop that led to customs controls on the Irish Sea. However, a wholesale purge of the original draft is not thought likely. RTÉ News understands that the redrafting has been influenced by negotiations and conversations between the Task Force and British officials over the summer and into September. The specific elements to assuage UK demands, however, are not necessarily nailed down and agreed between London and Brussels. Q&A: What is the Brexit 'backstop'? Ambassadors from the 27 EU member states meeting in Brussels last Thursday were told by the Task Force not to expect any move on the backstop by London before the Conservative Party Conference, which begins on 30 September. Member states were also briefed on the latest attempts by the Task Force to "de-dramatise" the backstop, which Mr Barnier has suggested would make it more acceptable to the British government. "The official line is to look at each individual check in a de-dramatised way," according to one EU source on the negotiations. "Where they take place, what is really necessary behind them, looking at all the data flows, and then trying to work out what is absolutely necessary in that respect. "At the same time there’s a question on how you make that work [legally]. The EU hasn’t budged at all on the line that it still entails Northern Ireland joining the customs territory of the EU." As part of the "de-dramatisation" approach, the Task Force is proposing that British customs inspectors could - on their own - carry out inspections at British ports on goods going from Britain to Northern Ireland. The original draft protocol suggested that customs checks would "be carried out jointly by the [European] Union and the United Kingdom customs authorities competent for the territory of Northern Ireland". However, under a new draft being worked on British inspectors could carry out such checks on their own. Well-placed sources say, however, that they would be applying the EU’s rulebook - as enshrined in the Union Customs Code - and that the normal EU infringement system, as adjudicated by the European Court of Justice, would be invoked where there was a problem. The ECJ role may not be spelled out starkly, but would be implied, according to officials familiar with the process. The Financial Times this morning reported that checks could also be carried out on ferries or at factories in Britain under "trusted trader" schemes. 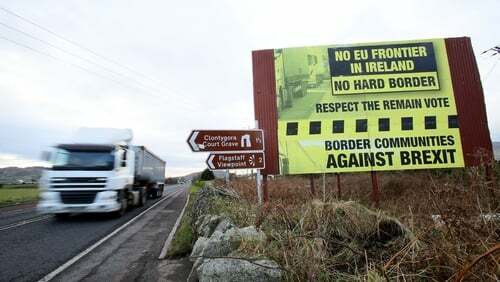 On the use of technology, EU sources have insisted that while hi-tech solutions could make the backstop more acceptable to the UK, they would not be used at the Irish land border, but rather at British ports. It is understood that Mr Barnier’s deputy Sabine Weyand, told EU ambassadors last week that technology was part of the "de-dramatisation" approach. An EU source briefed on the meeting said that Ms Weyand had insisted that "the fundamental principles of the backstop have not changed". Tánaiste Simon Coveney has said negotiators were not contemplating using technology to solve the issue of the border, but its use to help simplify checks between Britain and the island is a "different question". "We are not talking about technology to solve the border on the island of Ireland question. Whether technology can help east-west trade is a different question to make the checks as simple and as de-dramatised as possible but that is a matter for the negotiating teams," Mr Coveney told RTÉ. Meanwhile, the DUP is unconvinced by suggestions that a technological border in the Irish Sea is more deliverable than one on the Irish border. "Suggestions that the EU is now considering technology-based solutions are a positive if belated development," MEP Dianne Dodds said. "However, this will become null and void if based only on the EU goal of ensuring Northern Ireland remains in a common regulatory and customs areas inside the EU. "Equally we are unconvinced by arguments which suggest that a technological border in the Irish Sea is more deliverable than on the land border between Northern Ireland and the Irish Republic." The Minister for Finance has said the current porous and border arrangements remain as a very sensitive stage of the Brexit negotiations gets under way. Paschal Donohoe is in Belfast meeting groups from the business sector, including the Northern Ireland Chamber of Commerce. Speaking to RTE News, he said: "We are completely committed along with the European Union and the British government to avoiding a hard border. "I came across a completely porous and open border today ... and we are determined now, through the European Union and with the good faith of the British government, to ensure that continues to be the case into the future. "Our objective is to ensure that there is no infrastructure on the border, that there is nothing that could destabilise the peace process or destabilise the economic trade or the flow of people and goods across the border."